I sm so excited that summer is here — one of my favorite seasons to be in the kitchen and enjoying the amazing produce available. Frank and I love seafood of all kinds, especially fish. I’m always on the lookout for new ways to prepare it since it’s such a quick, easy thing to fix on weeknights. I found this recipe in June’s Cooking Light issue (one of my favorite sources for fresh and healthy recipes). The fish was simple and delicious; we followed the recipe for the slaw, but would probably go back and use my own recipe for slaw when we make these again. 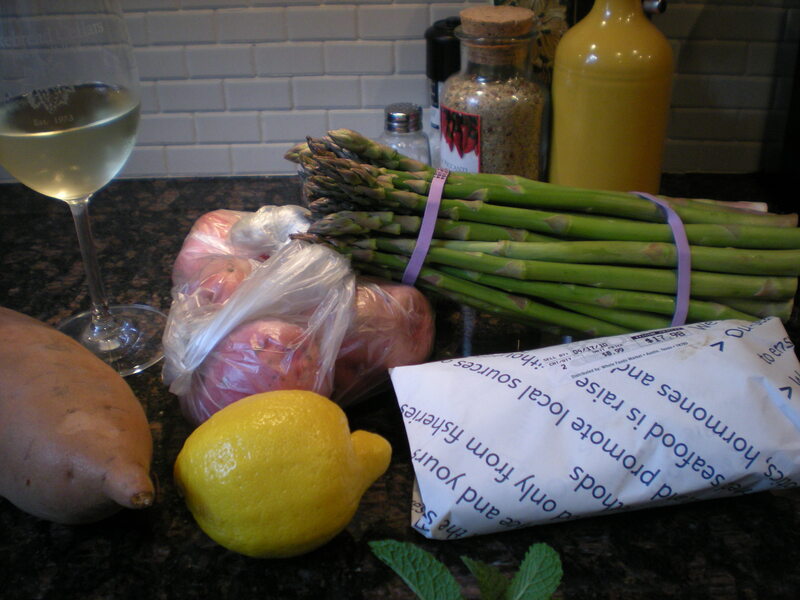 Overall, very good and very quick for a weeknight summertime meal. Ididn’t get my own photo, but below is the one from the mag. Doesn’t it look good? Combine first five ingredients in a small bowl. Sprinkle over fish, coating well on both sides. Heat cast iron skillet over high heat. Add oil to pan and swirl to coat. Add fish and cook 4 minutes on each side or until done. Combine yogurt, juice and honey in a large bowl; toss together with slaw and cilantro. 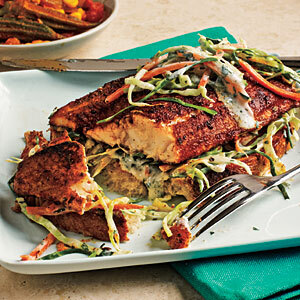 Top bread slices with slaw, fish and remaining slaw. I adore fish, but am picky about it. Luckily, Frank is a master of grilling all kinds of fish and his sea bass is rave-worthy. And since he usually takes a beating on the blog, I thought I would prove to you all that he does have redeeming qualities, one of which is his ability to grill. We were at the Whole Foods last weekend, deciding what to cook for dinner and ran across these beautiful sea bass fillets on sale. The good thing about sea bass fillets are that they are thicker chunks that flatter grouper or tilapia or other types of white fish and therefore don’t flake off or fall apart on the grill as easily. This preparation was beyond simple and the fish turned out so tender and juicy — just fabulous. Serve with some roasted asparagus or a salad and new potatoes and a crisp white wine. Preheat grill to high heat. Spray down a grill basket or other type of grill grate with cooking spray and place on grill to get hot. 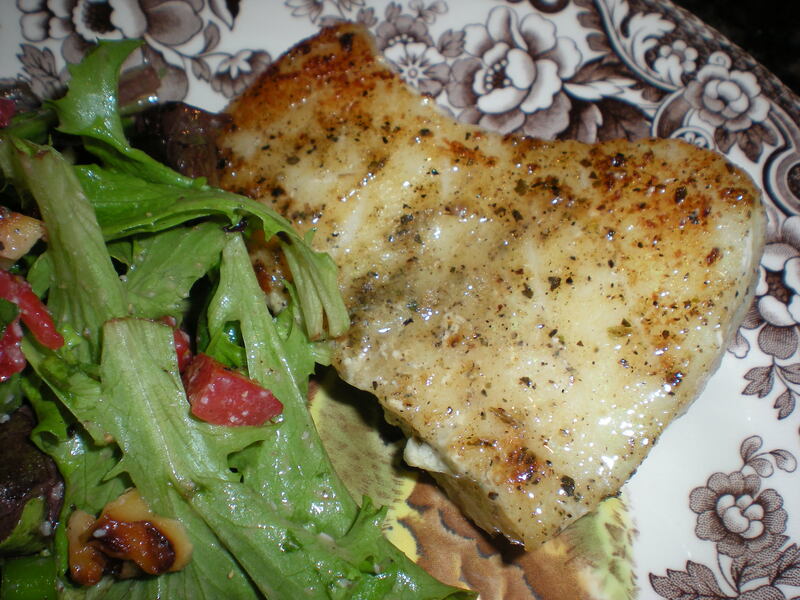 Season sea bass with greek seasoning (we like Cavenders) and drizzle with a little olive oil. Grill for about 7 minutes on each side, careful to only turn them once, if you can help it. The result is a nice crisp top and bottom and tender meat on the inside.